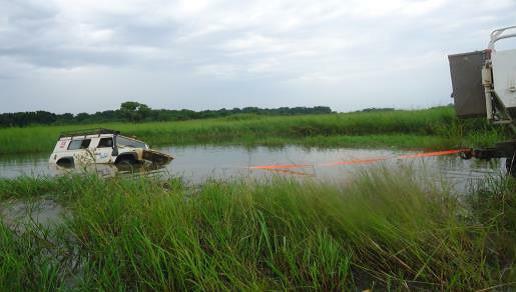 Developments in Bentiu State late last year resulted in the closure of many routes due to the possible relaying of Anti-Tank mines. 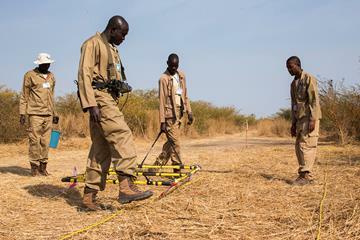 The United Nations Mine Action Service (UNMAS) awarded TDI a contract to conduct emergency route verification and clearance tasks (ERVCT) as and when required to allow for safe passage of UN and other vehicles providing humanitarian aid. TDI mobilised two teams in August 2015 for a period of 6 months. Initially the teams were predominantly located in the South due to the conditions during the rainy season. Once the rain receded in the North, the teams were then able to conduct operations from Bentiu where there was, and still is, a high priority requirement for United Nations Mission in South Sudan (UNMISS) on route verification of six important roads in that area. A major achievement by the ERVCT was crossing a seemingly impassable wet gap on 10 January and finalising the verification of an anti-tank mine location on the Mayom Junction to clear the Mayom route on January 19. 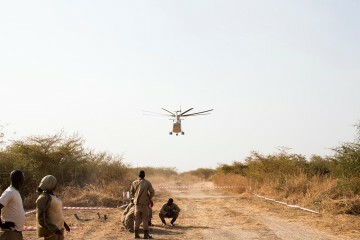 Completion of this incident area and continued route assessment onto Torabeid and Mayom effectively opened the route between Bentiu and Abiemnom to the mission. The teams also cleared the way to the Rubkona Airfield Extension which was an UNMISS directive to allow for larger aircraft carrying humanitarian and mission supplies. The airfield serves as the sole logistics point during the rainy season for aid deliveries to 40,000 IDPs in the UNMISS Protection of Civilians (PoC). The teams were stood down in January 2015 at the end of the contract.